Between 2007 and 2009 GameLayers made a multiplayer game across all the content of the internet. I was the CEO of GameLayers and one of the co-founders. Here I'll share stories and data from this online social game startup. This story covers prototyping, fund raising, company building, strategic shifting, winding down and moving on. In 2006, I was an MFA graduate student at the University of Southern California Film School Interactive Media Division. I was living with M (name and likeness redacted by request), a creative writing major at USC. A reformed journalist, I attended grad school to learn to make the kinds of software I'd only written about before. I was watching people play World of Warcraft and I wanted to have those kinds of immersive persistent social travels through dataspace. WoW looked like fun! But I couldn't focus on one MMO -- too much time investment required. How about an MMO (massively-multiplayer online game) for life on the web? M and I teased out ideas for a role playing game mapped to web surfing, so you can earn points for doing what you're already doing! Mentored by a number of agreeable engineers, I rigged up a single player prototype, using a Firefox extension that saved my web history to a file, then parsed that web traffic with PHP to give myself Dungeons & Dragons-style attributes. Surfing a lot of Flickr gave me high dexterity but lowered my constitution. Surfing the Wall Street Journal raised by intelligence but lowered my wisdom: hand-coded game values for a few sites. M made art for each of the attributes; with some art from M it was enough to present at a conference Aula summer 2006 in Helsinki, Finland. So now this became PMOG: The Passively Multiplayer Online Game. From fall 2006 to spring 2007 we worked: myself Justin Hall as producer/web monkey, game designer/writer M, and a UK game engineer Duncan Gough whom we found through our friend Matt Webb. My last year there I was able to take a class "Business of Interactive Media" with a long-time game industry idol of mine, Jordan Weisman. He has started multiple successful game production companies based on new media and new markets. He shared data from his work with the class, giving me the spreadsheet tools to model the cost of running a business and launching projects. Now I could begin to imagine how to sustain and grow a new game idea. We showed PMOG in the IMD May 2007 and we had 1,500 players! 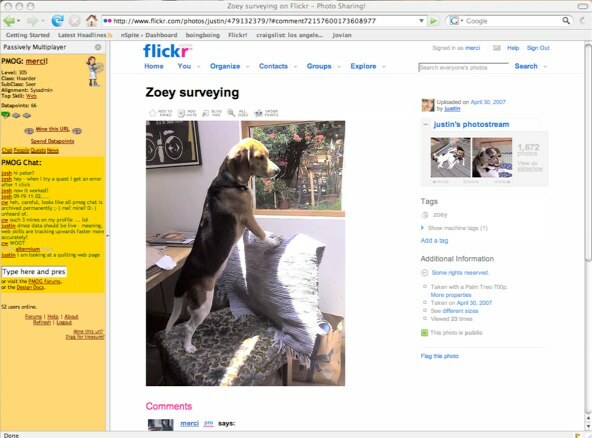 Duncan built a basic Firefox sidebar to host a working web annotation game with character records and user generated play objects across web sites, much of the functionality that we'd initially envisioned for the game. It felt like a game, or at least a fun web toy, with a chat room filling up with return players. This was mid-2007. The web was booming -- new services were being funded and taking off. There was a sense that you could grow an idea into something large, and it would make money from your large audience, or it would be acquired by Yahoo!/Microsoft/Google.